One day old Moo Man. In May 2018 I found Miri wondering around begging for food on the streets of Boston. She was a local visit of the area. Everyone loved her because she was exceptionally friendly. After speaking with a man who knew her very well, he explained his attempts to find her possible owners were coming up cold. He could not adopt her as he already had his own fur babe. Therefore I had her brought to a vet in the Boston area. She was not chipped, but she did have multiple problems often seen in street cats. She had all the tests run that one would for a stray cat. She had ear mites, roundworm, and Feline Lukemia. I decided at that point I was going to adopt her. I had Penny’s shots up to date, she received medicine for her worms and mites, and was chipped. I then brought her into a new apartment I just moved into. Things were seeming to settle after a month of getting to know one another. She seemed to have common street cat behaviors such as practically inhaling her food, waking me up early hours of the morning to feed her, but overall seemed pretty happy. She seemed to be gaining a bit a weight, but I figured she would slow down on her eating habits once she acclimated to the feeding schedule. On July 6, 2018 I came home from work to find a particularly needy Penny. She continued to meow after I fed her. I sat down on the couch and called her over for a cuddle. She attempted to sit on my lap but couldn’t quite get comfortable. No matter how many circles she went in, she couldn’t quite find a spot she liked. I tried to put her on the couch, assuming she could find something suitable there, but she quickly crept back onto my lap. Then she began to have contractions. It looked as if she was sucking her belly in and out dramatically. I began to panic. When I was a child, I watched my dog Nala give birth. Penny’s body and behavior was very similar. So I began to panic, as she pushed out the first jelly blood filled sack or kitten. She carried her baby upstairs to the closet. I think she wanted some privacy, but I couldn’t help but follow. She gave birth to the second kitten within minutes, on a pile of shoes. She cleaned them, fed them, and protected them. But after about 30 minutes of this behavior she began to act distressed. Her body began contractions again but nothing came out. She looked at me as if to say help and cried out continuous meows. I had no idea what to do. I waited about an hour before I knew something wasn’t right. I drove her and her two babies to the local animal hospital ER. It was here I discovered there was in fact one more kitten in her belly, but was stuck. It was now about midnight when the vet told me she wouldn’t be able to have it naturally and they needed to act quickly to remove the kitten alive. The procedure would cost $4,000 and there were no payment plans. I couldn’t do it, it was impossible. I told the vet I would wait until morning to see if she could have it naturally comfortable in her home. They spread the guilt very thick, explaining the kitten would not survive until morning and Penny would need surgery either way to have the kitten removed once it passed away. But I had no choice. Finally I found one that told me they would try to help. I brought her in and they gave me a much more manageable amount ($1,200) with an option to pay with a vet credit card. Later, I found out Penny was not positive for Luekemia (which is essentially a death sentence for cats) but AIDS positive. According to the vet, AIDS is a much less invasive disease which is much less harmful and most cats never have issues with it. Now, 4 months later, Penny and all her kittens are thriving. 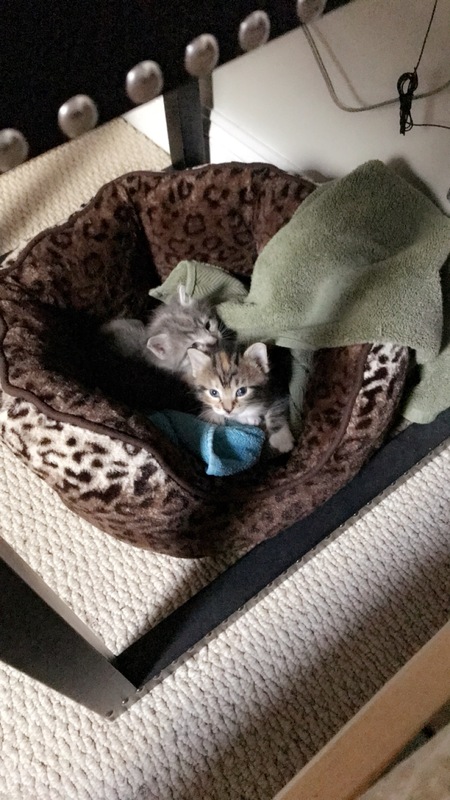 A friend adopted the first two kittens of the litter and I kept the Miracle C section kitten. Moral of my story? Adopting the beautiful mama was the best decision of my life. We have some severe ethical and moral issues with some Vets, as they operate more as a business than a place of healing and health. A collection of Penny and her babies (OG names): Penny Jr., Moo Man, and 1,200 dollars. Now named Nox, Lumos, and Miri.